Designed for 14" snare drums, the Custom series snare wires feature 20-strands of medium-gauge wire, allowing for an increased snare presence. The Custom Series wires feature medium-gauge wire with evenly spaced standard coils. The Custom line offers four different strand configurations that can be employed to change the balance between the drum and snare components of the sound. Models with more strands tend to allow the snares to be more active in influencing the sound while those with less strands allow the drum to be more prominent in the overall sound. 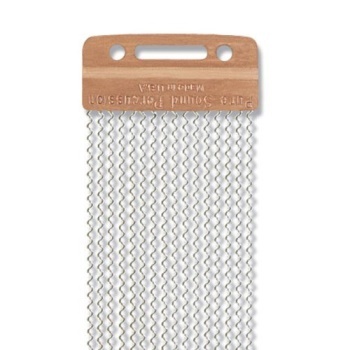 PureSound offers a wide variety of professional quality snare wires including a selection of vintage wires designed specifically for older snare drums with unique snare mechanisms. PureSound snare wires are designed, engineered and manufactured in the USA to the most stringent quality controls in the industry.